Amnesty campaigns for Judea, Samaria boycott, Finance Ministry aims to revoke tax benefits from organization's donors. Finance Minister Moshe Kahlon (Kulanu) is working to revoke tax benefits from Amnesty International's donors, in accordance with the Boycott Law, Hebrew-language news agency Israel Hayom reported. Two months ago, Amnesty submitted a report titled, "Israel's Occupation: Fifty Years of Dispossession." 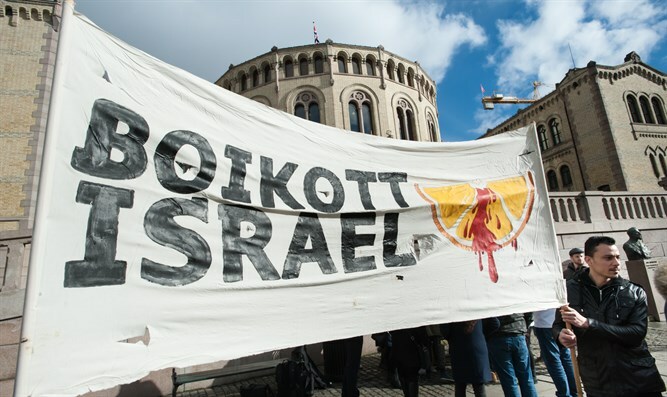 On their website, international advertisements, and Facebook page, Amnesty called on the world's countries to boycott Israeli goods manufactured in Judea and Samaria, and place a weapons embargo on the State of Israel. Amnesty also claimed Israel is a "war criminal" because the "settlements" are "war crimes." Kahlon's efforts would revoke tax benefits from Amnesty's Israeli supporters, a step which is expected to severely harm the amount of donations the organizations will receive. In a letter to Kahlon, MK Miki Zohar (Likud) wrote, "Amnesty works constantly to persecute and slander IDF soldiers. Once, they even claimed IDF soldiers starve Palestinian children. Amnesty supports illegal infiltrators and draft refusers, and works with all its might to harm the State of Israel." "I ask you to use the Boycott Law, which will enable us to immediately revoke Israel's recognition of donations to Amnesty, since it is an organization which encourages others to boycott all or part of Israel." B'tsalmo Jewish Rights Organization CEO Shai Glick said, "It is unheard-of absurdity when an organization works against the State of Israel but receives tax benefits worth hundreds of thousands of shekels from that same state." "The Boycott Law was enacted exactly for this purpose, so that we will not fund those who fight to boycott us. It's time Israel's government worked to cut all ties with this organization and with all others who fight it. We should not be granting these organizations any kind of funding. "I call on the Finance Minister to use his authority to immediately revoke the benefits." Glick also said Kahlon has the authority to "immediately revoke" the tax benefits, "without receiving any prior approvals, legal or otherwise." "I will do everything I can, including revoking tax benefits of organizations which aim to harm the IDF or the State of Israel," Kahlon said. Amnesty International responded, "We do not respond to politicians' populist initiatives. When there is a need, we will reply officially to the authorized bodies, such as the Finance Ministry, and discuss the topics." In June, Amnesty International called on the world to boycott Israeli products. Also in June, MK Bezalel Smotrich (Jewish Home) called on Israel to revoke the organization's tax-free status. In 2015, Amnesty International rejected a motion to fight international terrorism.